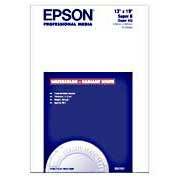 Thank you for the tip about Epson's 'Watercolor Paper Radiant White'. You said you liked this for B&Ws. Is it equally usable for color work? Both of these papers are excellent for color work. As with B&W, the Velvet Fine Art paper is slightly richer in the shadow detail and a tad sharper, but that's only noticeable when you place the same prints side by side on the different stocks. I am trying to get a decent print from the watercolour paper with my Epson 2200, matte ink, with no success. The print looks very wimpy, the black tones block up starting at about 40 40 40 RGB, the black is gray, very horrible. I'm using the profile from Epsons site and have tried everything I can think of. The same files print spectacularly on enhanced matte. I have been using my Quick Cam for 5 days and I realized that the more you use it the more features it seems to have lol. When I switched to B&W using the Advanced Feature... WOW the image was gorgeous! Thanks for this very helpful review which has just saved me cÂ£50 as I was about to order the Velvet! About to embark on my first foray into printing some of my nature photos, hope I get the sort of results you describe.